Here are the slides for Session 3. 2.March 28 : Basic of programing. Line Squaring: In many cases, when the robot is coming towards a line, because of mechanical drifts, it is not likely to end up on the exact same place on the line all the time. Thus, the robot needs to calibrate itself with regards to the line. The process of turning and making itself exactly 90 degrees to the line is called Line Squaring. This is an advanced technique and is possible reliably ONLY if you have two color sensors. The color sensors are best positioned when they are about 3 pennies stacked from the ground and completely level with the ground. The color sensors should be about 1 inch apart i.e. just slightly wider than the thickness of the line on the FLL mats. Additionally, it is important that you position your color sensors as close to the front and slightly under the body of the robot to avoid interference from external light. Here is something critical about the color sensor: The color sensors GENERATE all the light they need to measure the reflected light intensity or the color. So, in an ideal case, you should shroud them in such a way as to completely douse any external light. 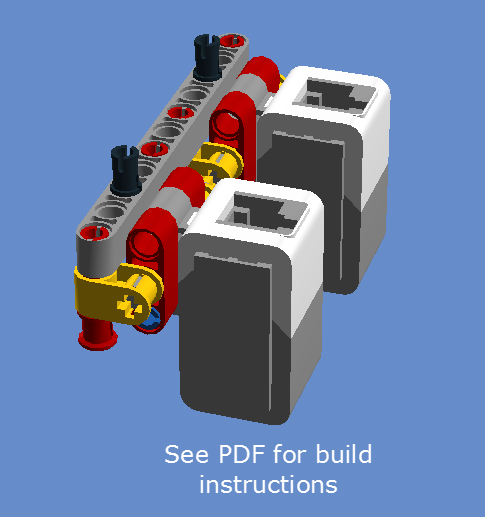 Use the Lego angular beams (Design ID: 32526) to create a shield around the sensors. We have been busy cranking up a new application for kids. It has taken a lot of time and patience, but we are now proud to present our new series of children’s books “Adventures of the Cat.” The first in this series is the “Cat and the Pumpkin” story. We are really happy with the work. The story is unique and fun for kids. The quality of the illustrations and the voice over are both superb. This app has been released as a Universal Application. Means, you buy it once and it will work on your iPod, iPhone and iPad devices. We hope you enjoy them. We certainly did! Just know that we hate spam as much as you do. We will never sell, give out or in any ways make your email address available to anyone else. This is only to notify you when you can get new free coupon codes. If you don’t want to receive mail, just let us know and we will take you off our list! We have just released updates to “MathQuiz with Solutions” and “Solve It!” Right now they are going through Apple’s review process and should be in your hands, er, your iPhone/iPod/iPads soon! We have worked pretty hard to make these updates and they contain many usability and pretty UI updates. Solve It! for iPad: This application is open at the Grand Opening of the iPad store. It guides kids step by step in learning basic math i.e. Addition, Subtraction, Multiplication and Division. It supports two digit operations and teaches kids to use carry and solving problems in an intuitive manner. Catch’ em All: This application is live on the iPhone AppStore. This is for very young kids (ages 1-3) who are learning counting up to 100. It teaches them counting using a fun game where they have to catch apples falling from a tree. This is a kid proof application with simple finger control of the basket under the tree.